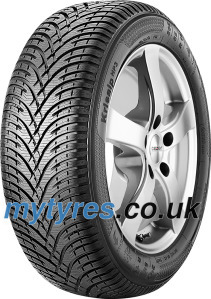 'A very well balanced winter tyre with good wear performance. KLEBER Krisalp HP3 is awarded the 3rd place out of 16, outranking all its main competitors and several premium brands. Comparative test done by ADAC on dimension 195/65 R15 91T, published on 26 September 2017. Excellent security on snow thanks to numerous horizontal sipes. A rubber produced from functional elastomers together with numerous and better positionned sipes enhance road grip on snowy roads(1). and shortens braking distance by 1m on icy roads(2). Jumps up one level for WET labelling, from C to B rating(3). 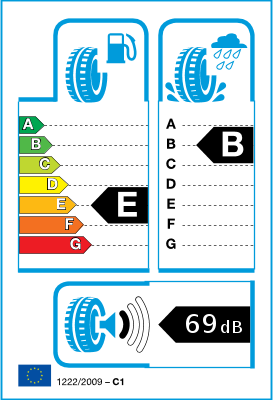 Reduced braking distance by 2.2m on wet roads(4). Its V-shaped directional tread pattern and its toboggans, facilitate water evacuation, which reduces aquaplaning risk(5). *Marking 3 Peak Mountain Snow Flake. **Mud & Snow. (1) Braking distance reduced by 4% i.e 1m, and startability improved by 5% on snow compared to previous range KLEBER Krisalp HP2 on dimension 205/55 16 91H. Michelin Group internal test conducted in December 2015 and January 2016 at Ivalo. (2) Braking distance on ice reduced by 8% compared to previous range KLEBER Krisalp HP2 on dimension 205/55 16 91H. Michelin Group internal test realized in October 2014 on Clermont Ferrand ice rink. (3) Labelling upgrade from C to B compared to previous range KLEBER Krisalp HP2. Source: Product Tracking Report August 2015. (4) Braking distance on wet roads reduced by 2,2m ie 6% less compared to previous range KLEBER Krisalp HP2 on dimension 205/55 16 91H. Michelin Group internal test realized in December 2014 at Ladoux Technology Center. (5) Resistance to aquaplaning increased by 15% in longitudinal and 13% in curve compared to previous range KLEBER Krisalp HP2 on dimension 205/55 16 91H. Michelin Group internal test realized in December 2014 at Ladoux Technology Center. **Prices include VAT and delivery within mainland UK (excl. special areas).